Students are invited to take the opportunity this holiday school break to focus on their tennis skills. LBHS girls and boys tennis coach Rick Conkey, along with an international-level coaching staff, will offer a four-day clinic. It’s open to seventh to twelfth grade players and offers an effective student to pro ratio. Students will be able to take advantage of the latest state-of-the-art coaching equipment and methods including video analysis, programmable ball machines, a speed gun, and bio-mechanical breakdown and analysis of all major strokes, strategy, court position, and drills. The camp runs from December 31 through January 3 from 11 a.m. to 1 p.m. The cost is $149 with a daily drop in rate of $45. Sign up through the City of Laguna Beach here. LBUSD held its monthly Board of Education meeting on Tuesday, Dec 11. During the meeting, Board members Carol Normandin and Dee Perry took their Oaths of Office. All Governing Board members must take the oath or affirmation prior to entering upon the duties of their office. Dr. James Kelly, LBUSD’s newest Board member, was unable to attend and will be sworn in at the January 15 Board meeting. The Board also elected its slate of officers as following: Jan Vickers, President; Carol Normandin, Clerk; James Kelly, Member; Dee Perry, Member; and Peggy Wolff, member. Additionally, the Board approved the 2019 meeting dates as follows: January 15, January 22 (Board Governance session), February 12, March 12, March 26, April 23, May 14, May 28, June 11, June 25, July 16, August 13, September 10, September 24, October 8, October 22, November 12 and December 10. Also during the meeting, the Approval to Accept the 2017-2018 District Audit took place. Every year, the school district must file an audit report for the preceding fiscal year with the County Superintendent of Schools, the State Department of Education, and the Controller. The Laguna Beach Unified School District audit was performed by the independent auditing firm of Vavrinek, Trine, Day & Company, LLP. The audit determined that the District’s financial status remains positive and the firm highlighted the exceptional accounting practices in place in LBUSD. During the meeting, the Board of Education took action to approve the acceptance of the 2017-2018 District Audit. Another important item on the agenda at Tuesday’s meeting was the Approval of Positive Certification of First Interim Report. Local educational agencies are required to file two reports during a fiscal year (interim reports) on the status of the educational agency’s financial health. The interim reports must include a certification of whether or not the agency will be able to meet its financial obligations; the certifications are classified as positive, qualified or negative. A positive certification is assigned when the district will meet its financial obligations for the current and two subsequent fiscal years. The Continuous Improvement: Approval of Career and Technical Education Incentive Grant (CTEIG) Expenditures was another agenda item. The California Career Technical Education (CTE) Incentive Grant program was established in 2015 as a state education, economic, and workforce development initiative with the goal of providing K-12 students with the knowledge and skills necessary to transition to employment and postsecondary education. LBUSD’s allocation of the grant for the 2018-2019 school year is $110,995; the funds are to be used for continued implementation and expansion of the CTE Program at LBHS. Laguna Beach Unified School District is one of 373 school districts in the U.S. and Canada being honored by the College Board with placement on the 9th Annual AP District Honor Roll. To be included on the 9th Annual Honor Roll, LBUSD had to, since 2016, increase the number of students participating in AP while also increasing or maintaining the percentage of students earning AP exam scores of 3 or higher. “I am always impressed by the ongoing success of our students,” said Superintendent of Schools Dr. Jason Viloria. “These are rigorous courses that demand a high level of dedication, and I am proud to see an increase in student participation as a result of the ongoing efforts of our staff to identify and support students who have not traditionally accessed AP courses and through the addition of new AP course offerings. In our focus on continuous improvement, we have dedicated resources to ensure that every student feels supported academically and social-emotionally as they take on these challenges,” he concluded. Increase participation/access to AP by at least 4 percent in large districts, at least 6 percent in medium districts, and at least 11 percent in small districts; increase or maintain the percentage of American Indian/Alaska Native, Black/African American, Hispanic/Latino, and Native Hawaiian/Other Pacific Islander students taking exams; increase or maintain the percentage of American Indian/Alaska Native, Black/African American, Hispanic/Latino, and Native Hawaiian/Other Pacific Islander students scoring a 3 or higher on at least one AP exam; and improve or maintain performance levels when comparing the 2018 percentage of students scoring a 3 or higher to the 2016 percentage, unless the district has already attained a performance level at which more than 70 percent of its AP students earn a 3 or higher. LBHS Girls Basketball continues its remarkable turnaround season, ending the week with a 15-1 record. “This is the mid-way point of the regular season and the schedule gets significantly harder from here…next week we start our Sunset League schedule and we know that even a single victory from that point on will be hard to come by. The girls are ready to battle and we’ll see what happens,” said Coach Tietz. The success of the season thus far has come from great team defense that is allowing just 18 points per game and an unselfish, balanced offense that has everyone contributing, according to Coach Tietz. The team is being led by senior Point Guard Mia Pitz. She is averaging 12 points, 3.7 assists and 3.8 steals per game and her season totals in those categories put her near or at the top of the CIF Division 5A rankings. Junior Madi Garwal’s 170 rebounds is putting her on a pace to destroy the school record of 293 she set last season and is currently 3rd in the entire state in that category. Another great two-way and all around player, Madi is averaging 7.2 points, 13.1 rebounds, 2.8 assists, 3.2 steals and 2.2 blocks per game. The third returning starter, junior Julia Henry continues to be a force on defense leading Division 5A and 10th in the state with 32 blocked shots. The other two starting spots have been filled nicely by freshmen Anna Cheng and Autumn Moreland. Anna leads the team in scoring at 13.3 points per game and her 35 3-pointers ranks #1 in Division 5A and #4 in the entire state. That number also surpasses school legend Alexandra Lewis’ total for a freshman at LBHS. Her 55 steals also ranks #1 in Division 5A. Autumn has provided the team with much-needed physicality inside. Despite giving up several inches in height to her opponents, Autumn’s tenacity has resulted in 9.9 rebounds per game. She also contributes at the offensive end with 3.2 points per game. The bench has also has made significant contributions to the team’s success. Sydney Mangus, Clarice Curras, Laila Hassan, Rebecca Sanchez, Zoe Payne-Carter, and Claire Smithers as a group have averaged 5.9 points, 11.8 rebounds and 2 assists per game. The team also has Hana Ford waiting in the wings as she complies with CIF’s mandatory sit out period for transfers. “Hana will be a force inside and figures to be a large part of the team’s end of season push for a spot in the CIF playoffs,” said Coach Tietz. The Breakers’ next game is against Corona del Mar on Tuesday on the road. Tip-off is at 5 p.m.
On Friday, Dec 14 from 4 - 9 p.m., hundreds of local girl scouts will be on board the trolleys singing holiday carols for the community to enjoy, while they traverse the streets of downtown Laguna. In addition to caroling for the Laguna community, participating girl scouts will also make hundreds of candy cane cards for our military troops stationed abroad during the holidays. Join in with the holiday singing fun or simply stop and listen as they go by singing delightful songs. Laguna’s Boy Scout Troop 35 and the congregation of its chartered organization, Laguna Presbyterian Church, collected socks for the homeless during the month of November. The service project was part of the Laguna Beach Hunger and Homeless Awareness Month outreach and brought in over 400 pairs of socks. The scouts advertised the service project through social media and at local schools, and had a great return. Of the more than 400 pairs of socks collected, 50 percent were for men, 30 percent were for women and 20 percent were for children. The socks included standard white and black socks as well as pastel colors, bold designs, and even two pairs of Mike Trout Angels socks. 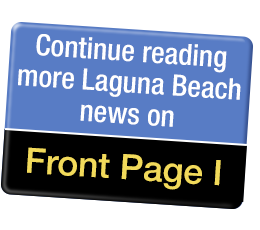 Laguna Beach Boy Scouts Troop 35 and Patrol meet every other Thursday at 7 p.m. at Laguna Presbyterian Church. The troop is lead by Scoutmaster Clay Leeds. For more information, visit www.lagunabeach35.mytroop.us. The agenda for tonight’s (Tuesday, Dec 11) regular LBUSD Board meeting has been posted online here. The meeting will begin at 5:45 PM with the oath of office for re-elected Board members Carol Normandin and Dee Perry (James Kelly is not able to attend and will be sworn in at the next LBUSD Board meeting). Open session will begin at 6 p.m. The Board will hear a report from Dr. Viloria and Dr. Keller on the district’s journey to a K-12 social-emotional learning system. Action items include the first interim budget report. On August 21, LBUSD staff presented information regarding the Social Emotional Supports implemented at LBUSD schools during the 2017-2018 school year and ongoing services in 2018-2019. Staff members also presented at the Annual Conference on Advancing School Mental Health regarding LBUSD implementation and more recently presented at the California School Boards Association Annual Education Conference. This presentation will include an overview of the information presented at both conferences, and also provide an update to include fall Universal Social and Emotional Learning. Last month, when Stu News reported that Laguna Beach’s Jade Howson qualified as the top Jr 18 and Under for the USA to compete in the 2018 ISA World SUP and Paddleboard Championships, it was a cause for celebration. Now she and her family have even more to celebrate. Jade (along with her mother Kris) has just returned from the 2018 ISA World SUP and Paddleboard Championships as a World Champion with a gold medal. It’s been a long haul for Jade, a 16-year-old junior at Laguna Beach High School, who has been paddleboarding since she was eight. “After a week of action in Wanning, China for the 2018 ISA World SUP and Paddleboard Championships, the 196 best paddlers in the world from 27 nations are headed back to their home countries. Robert, Jade’s dad, says, “I have always been a nervous dad. I want so much for my daughter to succeed as she has trained so hard to achieve her goals. Watching her in China, I was filled with such immeasurable pride! However, racing is never over until it is over. So much can happen even with a solid lead. You can have a physical problem, a mental error, or a mechanical failure of the board or paddle. Occasionally a lucky set wave can benefit the paddler from behind. All these things have happened to every seasoned racer. I was nervous for all those things. Before the trip to China, Jade already had gathered many awards and honors. Currently, she is ranked the 14th fastest woman in the world in the Paddle League Women’s World Rankings. Now, Jade is the 2018 ISA World SUP and Paddleboard Championships World Champion in the 18 and under Jr division and has the gold to prove it. Laguna Beach High School’s instrumental music groups have been invited to perform at Carnegie Hall in April 2019. The local community is invited to come hear these LBHS students perform holiday music at a free Winter Concert on Monday, Dec 10 at 7 p.m. in the LBHS Artists’ Theatre. Under the direction of Jeremy Chung, members of the school’s Wind Ensemble and Symphonic Band groups will travel to New York City to get coaching from Carnegie Hall’s professional music staff before their adjudicated concert performance together. Local support has meant a lot to these music students; earlier this year, the Festival Of Arts Foundation awarded a $5,000 grant to the Boosters who directly support these and additional instrumental music groups (jazz, strings, marching band, and drum line) at LBHS and Thurston Middle School. LBHS Artists’ Theatre is located at 625 Park Ave.